The UK entertainment industry has historically been a large producer of waste, especially when it comes to disposing of sets and props. Over the last 4 years Scenery Salvage initiated one of the first dedicated services for the reuse and recycling of scenery and props for the entertainment industry. Scenery Salvage run a fleet of purpose built vehicles (50% powered by waste vegetable oil) to collect set waste across the UK. Collections are taken to their recycling centre where they are weighed, sorted and recycled. Subject to client approval, loads are sorted into re-usable items, which are then catalogued and made available back to the industry at vastly reduced rates, and the remainder de-constructed into component materials which are then processed on site for further recycling. Timber is chipped and is sent to be reused in panel board manufacturing. Metal is segregated into different types and sent off for smelting for reuse in the metals industry. Plastics (acrylics and polycarbonates) are granulated and then sent for reuse in the plastics industry. Scenery Salvage can now also recycle polystyrene into compacted form logs which are then used as a fuel source for power production. Glass, textiles and floor coverings are also all recycled. 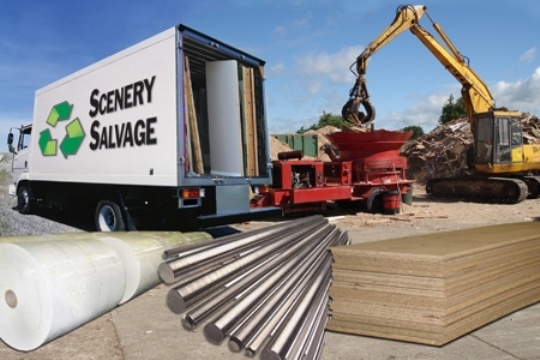 Overall, Scenery Salvage recycle over 95% of all waste.